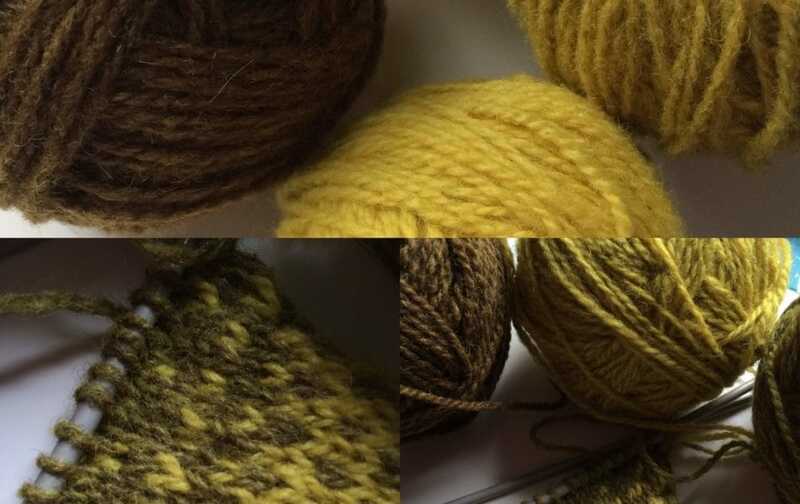 Absolutely AGES ago, the delightful Katie – lover and dyer of British wool and fibre at Sylvan Tiger – gave me a pack of her gradient 4ply Shetland in the Bumblebee colourway. I was so excited by the colours, but also the velvety squish of the yarns. 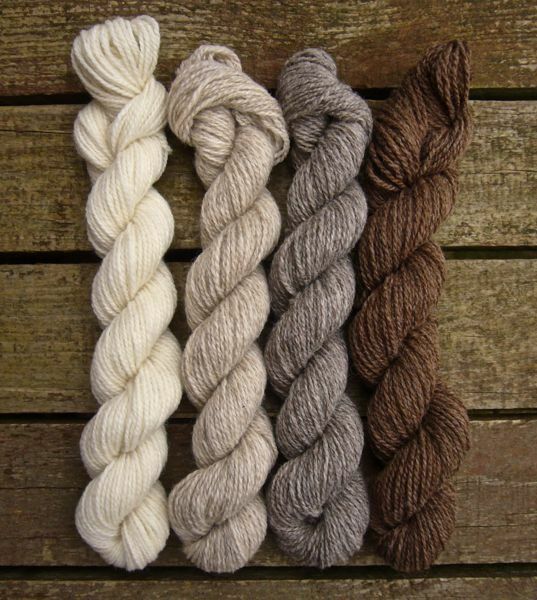 The Shetland yarn is spun at the Natural Fibre Company – so anyone having knit with this yarn from Blacker before will already know just how lovely their Shetland is! Katie takes four different colours of natural shades and overdyes them with natural dye extracts to create such a lovely gradient effect. I love squishing a skein of yarn and have it spring back in the hand and each 25g skein is incredibly bouncy and has that velvet feel that I mentioned. 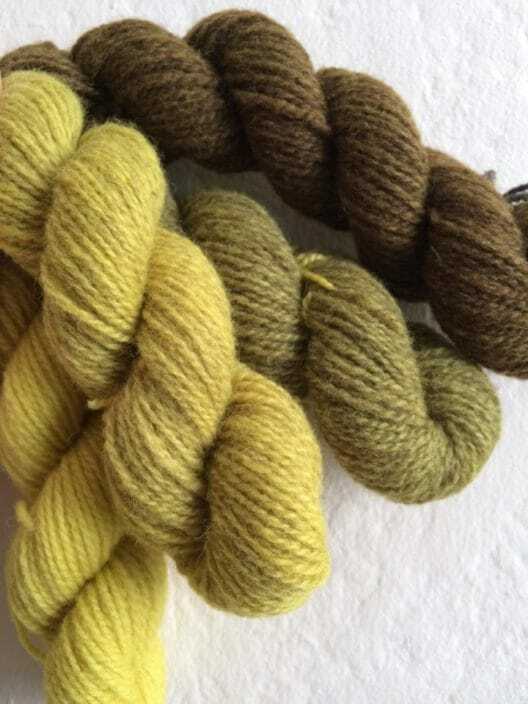 But don’t let that firm bounce fool you – the wool has been woollen spun at the Natural Fibre Co, so the resulting yarn is very airy and I felt that it would make a nice light, but insulating fabric. The colours in the pack range from the acidic, tart bright yellow, a lovely muddy ochre, dried rosemary and a deep khaki brown/green! I cast on 26 stitches on 3mm needles. I felt I wanted to knit a long swatch rather than an square one, and really give the different coloured yarns a chance to play! I knit stockinette. 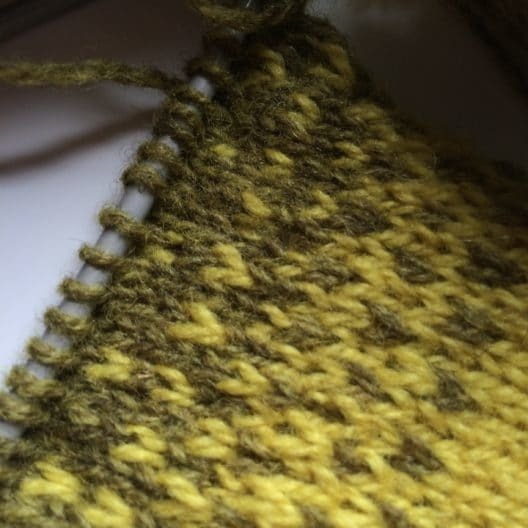 I was really not disappointed with how this wool knit, in fact it was like each stitch was begging to be knit – so soft, with an almost felty feeling (N.B this yarn is definitely NOT felted (though it will felt beautifully) it is just the feeling!). The stitches are almost magnetically drawn to one another in the swatch. The finished length was 13 inches long by 4 inches wide. I washed the swatch in a little wool wash – there was no dye which came out in the wash. Instead of pinning this out I just laid it out flat to dry. Once dry it was quite a stretchy and soft fabric. Shetland wool blocks exceedingly well, so had I knit a lace swatch I am almost certain it would have blocked quite aggressively. I wore the swatch…quite long at 13″ in the waist band on my trousers for a day. I was always aware that it was there, but there certainly was no prickle or itch. Rubbing the swatch on my inner forearm there is a slight whispiness against the skin, but I imagine most people would be able to wear this next to the skin. There was no discernible change to the fabric, no pilling or visible fuzzing. After the second wash, I would say the wool fabric softened even more. This time I did forget that I was wearing the swatch (And almost lost it down the loo!) 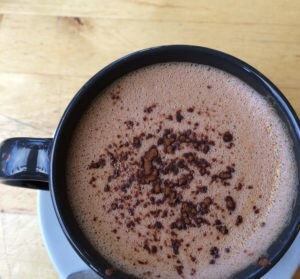 when I readjusted it and wore it on my hip I could feel the warmth where the swatch was. It is a light and stretchy fabric, but it sure will keep you warm. This was such a great yarn to knit with and I kept thinking of all the items it would be suitable for. Naturally, Fair Isle comes to mind and I thought how nice the colours would look like in a crofthoose hat or really striking in a gradient cowl or mitts. The colours used from light to dark (or vice versa) would be very nice in ombre designs, but I liked mixing it up. I used the lightest, the second darkest, the second lightest and the darkest, with a very little colour work in the changes, and I really liked the effect. 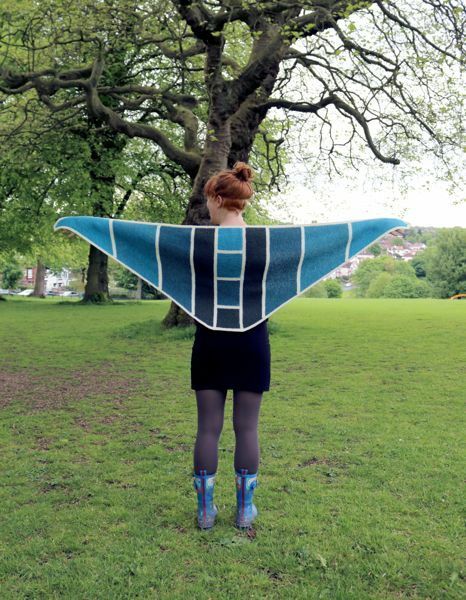 Kate has designed the Baltic Gradient shawl which really lets the blocks of the colours really take centre stage. Designer Gwen Wagner-Adair has also designed the Seafoam cowl and the Twinings Shawl – which really show off the hand-dyed gradients beautifully. The shawl takes just one 100g/350m pack of yarn and does indeed look like it blocks wonderfully. These three designs are available via ravelry. 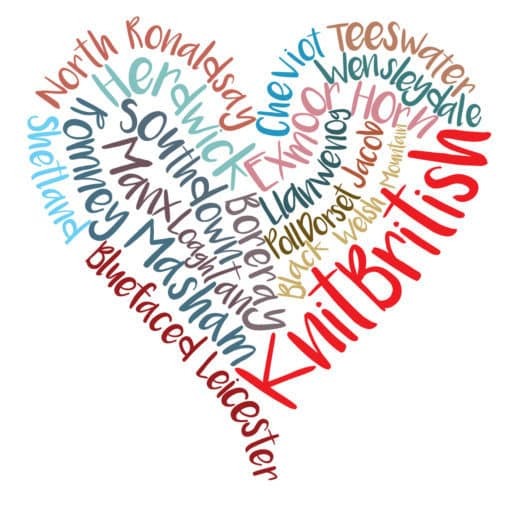 I – having grown up clad in Shetland wool – would have absolutely no qualms about knitting a baby blanket in these yarns and a fingerling version of Tin Can Knits Bounce blanket would look amazing! There are several gradient shades available, including the sumptuous Chocolate Orange and the shining Grass Greens. It almost feels like you should have the entire collection, as they are so special! You can read more about Katie’s gradient packs on her blog. 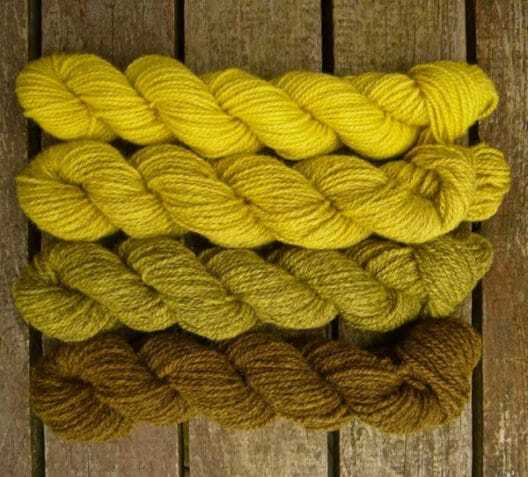 These yarns, along with her other lovely British wools, hand-dyed in Yorkshire, are available in her Etsy Shop. Please be aware that the shop will be closed while Katie takes her summer holibags (15th – 24th July). You can also follow Katie on twitter and Instagram. | Information – All images are copyright to their owners as stated, other images are mine. I was given this yarn to test by Katie and offer you a totally honest review. I was not paid for reviewing this yarn. Beautiful over dye! More Shetland yarn!!!! isn’t it just! 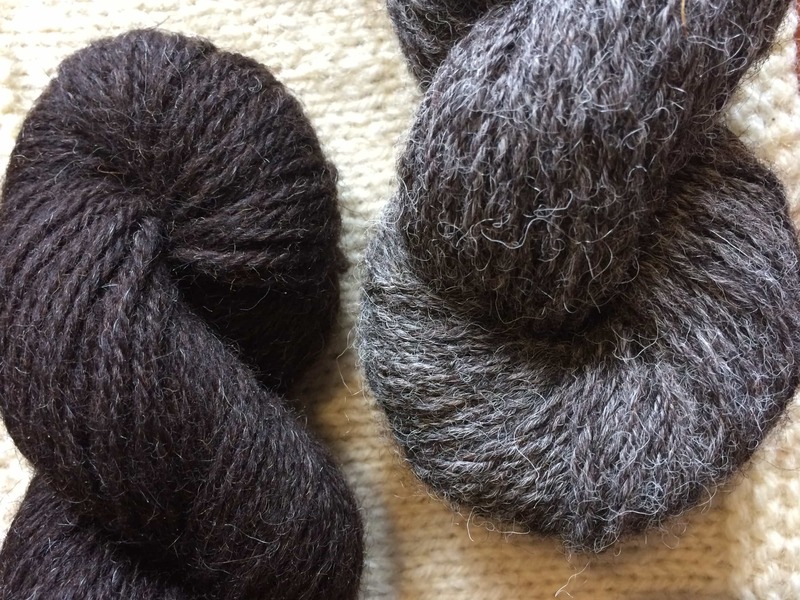 I am a bit biased about Shetland wool. I could actually knit acres of garter in Shetland wool and never be unhappy! What great results in the over dyeing . . . especially love the different values of grey. Thanks for sharing your success! Just to be clear, I didn’t dye these. Katie from Sylvan Tiger did. Katie is very talented, I’m knitting a hap in some of her lovely yarn at the moment. I just love the colours. I really must try these gradient packs. 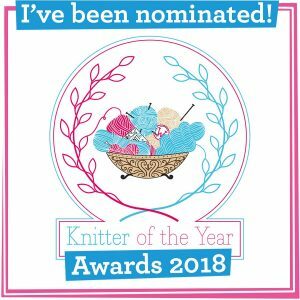 You can never have enough Shetland yarn, it is gorgeous, thank you for writing your review, it makes me want to try this yarn out even more. I love the look of the over dyed natural colors. Quite the inspiration.